This delicious pudding is perfect for serving in late summer when figs are at their best. If possible, use honey with honey comb from a farm shop for the best possible flavour. Wash the figs and cut in half, leaving them attached at the bottom. Place in a baking tin. Pour the water into the tin. Spoon around a dessertspoonful of honey into each open fig, along with some of the comb if using. Dot the mascarpone over the top of the figs and sprinkle with the cinnamon and nutmeg. Bake for 12 minutes. Baste with the juices before serving. 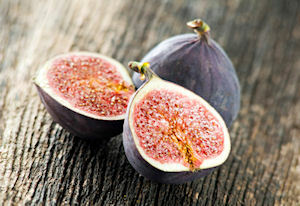 Serve these figs with some high quality vanilla ice cream. This recipe serves six people.